During our outdoor audio/video walk-through with the homeowner, an important decision is to be made whether or not to add an outdoor subwoofer. Outdoor subwoofers are responsible for the bass. Outdoor subs are an essential addition for a richer, more powerful audio experience.. With the help of our vendors, Sonance, Niles, Rockustics and Earthquake, outdoor subwoofers can suit any space, no matter the size; big or small. Why Should You Opt for an Outdoor Subwoofer? When it comes to outdoor audio, sound quality can easily become distorted, especially in open layouts. It’s important to choose an outdoor subwoofer that is going to distribute the necessary sound quality needed for your space. In some cases, without an outdoor subwoofer, you can turn your speakers to the highest setting and still have trouble hearing your music the way it should be heard. Some may even complain that their outdoor audio doesn’t sound “strong enough”. More often than not, it’s because they are lacking the deep bass that’s needed to evenly spread through their landscape. This is something Advanced Integrated Controls (AIC) could provide with a Sonance, Niles, Rockustics or Earthquake outdoor subwoofer. The good news is that you aren’t limited. If you are considering an outdoor subwoofer, there are many speaker sizes and models to choose from. There are two main types of outdoor subwoofers; rock/planter type subwoofers, or underground subwoofers. Underground subwoofers are just that, they’re in-ground. Once buried, the only thing that can be seen is the output tube - the part that emits sound. It doesn’t stick out too far and can be easily disguised. Sonance and Niles offer a sleek output tube design where the bulk of the subwoofer disappears into the ground, but we promise you’ll know they’re there. You can’t miss the deep bass rumbling through the ground! However, if you are looking for something that completely disappears into the landscape, Rockustics offers an in-ground subwoofer where the output tube is designed to look like a rock or large stone. In any case, underground subs are constructed to withstand extreme high and low temperatures. They are weatherproof enough to last through extreme moisture from rain and humidity. They’re also rust and erosion proof. Rock and planter subwoofers don't have to be buried. They are crafted to blend into your landscape. 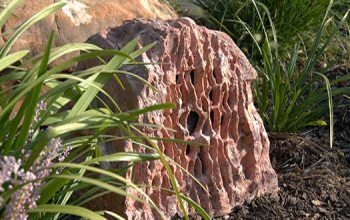 We previously explained that planter and rock speakers are eye pleasingly perfect for any outdoor entertainment area because they come in a variety of natural colors that blend into your garden, shrubs or around the pool. There are other options where the subwoofer can be custom build into your outdoor furniture, too! With the help of AIC, you can pair any in-ground, rock or planter subwoofers with any landscape. Or install a traditional speaker for a true sounding custom home theater you can enjoy outdoors! 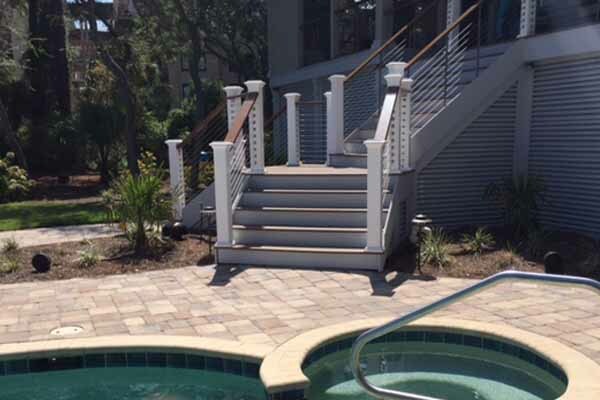 We take pride in designing and installing Outdoor Subwoofers projects in homes and businesses throughout Hilton Head, Bluffton, Palmetto Bluff, Savannah, Beaufort, and surrounding areas. Call us today at (843) 836-5700 to discuss getting your project started!